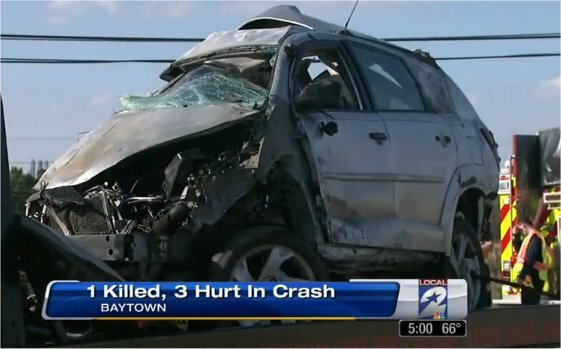 Police say a 26-year old man was speeding and weaving in and out of traffic in his silver-colored Pontiac moments before he caused a multi-vehicle accident that claimed his life and serious injured many other people. 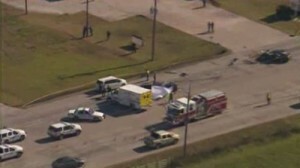 The three vehicle accident happened on Highway 146 in Baytown, Texas at around noon. Channel 2 News spoke to Dr. Bruce Meuth, a veterinarian who operates the Abisher-Meuth Animal Hospital at a location near the scene of the crash. The two other vehicles involved aside from the Pontiac were a FexEx delivery truck and a Lincoln car occupied by three businessmen who were reportedly badly hurt. Dr. Meuth and his staff rushed from their office to render aid and contact family member of the injured men to let them know about the accident. Police say the Pontiac driver was traveling northbound on Highway 146 when he lost control of his vehicle and crossed the center line into incoming traffic, colliding with the Lincoln. The men in the Lincoln were all transported by Life Flight helicopter and the FexEx driver was taken by ground ambulance with a leg injury. This entry was posted on Thursday, December 19th, 2013 at 12:50 pm and is filed under Accident Lawyer, Auto Accident.